Manufacturers produce a number of clips and brackets for fastening a copper pipe securely to a wall. These fixtures are commonly shaped to fit the curve of pipe with screw holes on one or both sides. Placing screws through these holes holds the copper pipe against the wall. Proper planning, during the wall construction, provides firm positions to fasten the fixtures in place. Place boards between the wall studs where you plan to place the copper pipe. These boards, commonly 2-by-6 boards, are placed flush with the front of the wall stud before the wall sheathing or drywall is installed. This step is not necessary if the copper pipe will attach to the wall at a wall stud. Install the wall sheathing or drywall and finish. The finish can include tape, texture and paint for drywall or simply paint for wood surfaces. Mark the location of the backer boards for reference. Install the copper pipe along the wall. Connect the pipe to all the fixtures and check for leaks before proceeding. Place a copper saddle over the pipe. The saddle is a flat copper strap bent to fit the shape of the pipe with a screw hole on each end. Place a 2-inch wood screw through each hole and fasten them in place into the backer boards installed earlier. Clips and saddles are available in a variety of colors and shapes. A copper saddle matches the pipes and may look best although a white or black fitting may also fit with the décor. Wall and ceiling brackets can also be used. These brackets hold the pipe a distance away from the wall and may be necessary in some projects. 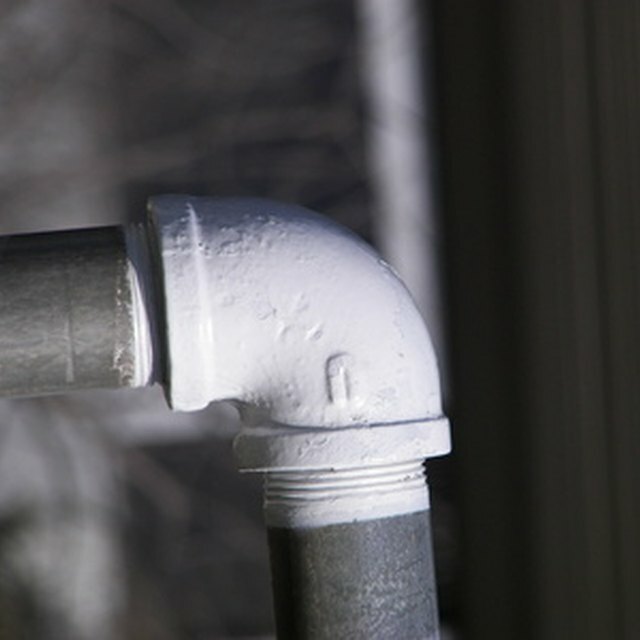 Cold water pipes can sweat or form condensation under some conditions. Placing this type of pipe directly on the wall can lead to water stains on the wall. Use a bracket to provide an air space between the wall and the pipe.